When we feed kids, we only think of the act of feeding them with a balanced diet and giving the necessary nutrients that they need for growing. Right. I sound like a line in a health book. Then, as a secondary consideration, we think of how it's going to taste like. After all, kids have the tendency to astound us with exceptional food combinations like fries dipped in vanilla ice cream (not my kids but some I witnessed when I was young), bread dipped in dollops of ketchup (my very own daughter) or peas sandwiched in between miniscule pieces of bread (my very own daughter again). Yesterday, my daughter had a playdate with her friend at home. I prepared them lunch of pasta con ragù alla bolognese (pasta with tomato meat sauce), filetto di pollo al limone e origano (lemon and oregano chicken fillet) and insalata d'arancia e finocchio (orange & fennel salad) concluded with shop-bought cakes. For snacks, I made some girelle alla crema di nocciole e crema di pistacchio-cioccolato (bread swirls or pinwheel sandwiches with halzelnut cream and pistachio-chocolate cream). The menu was kid-friendly, healthy and something that my daughter's friend's Mom & I can enjoy too. I initially thought that the salad would just be for us, adults. Instead, my daughter's playmate ate a significant portion of the salad and practically everything I served to her. She loved everything, which was a wonderful surprise to me. Rarely do people impress me with their food criticisms but what this child said to me while serving her the pasta con ragù made me stop and look at her with a well-deserved respect. I offered her some Parmigiano Reggiano for her pasta and she answered me in such a very un-4 year old manner. I was really impressed. I love how kids react to food, how they convey what they think of what they just tried, in their own candid ways. Her Mom is into health food and her Dad is into cooking. With their influences & knowledge combined, the daughter came out with a good food culture. 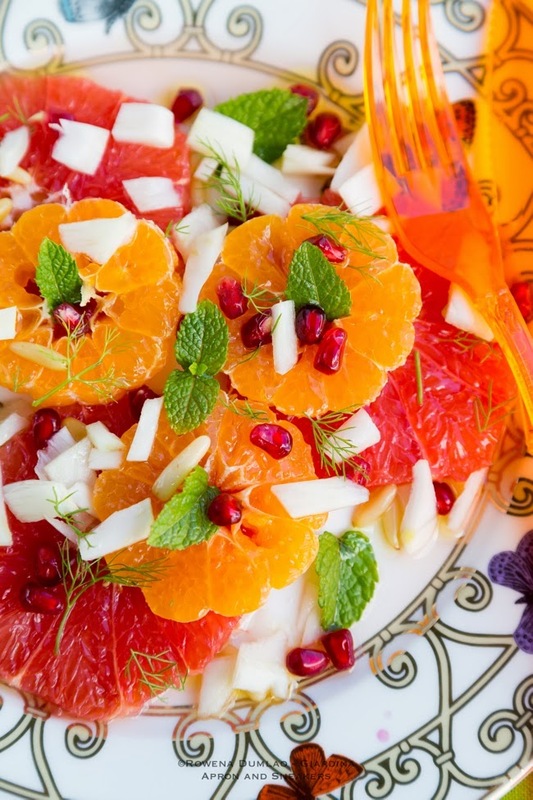 And if a 4-year old eats an orange & fennel salad with gusto, then we should follow suit. 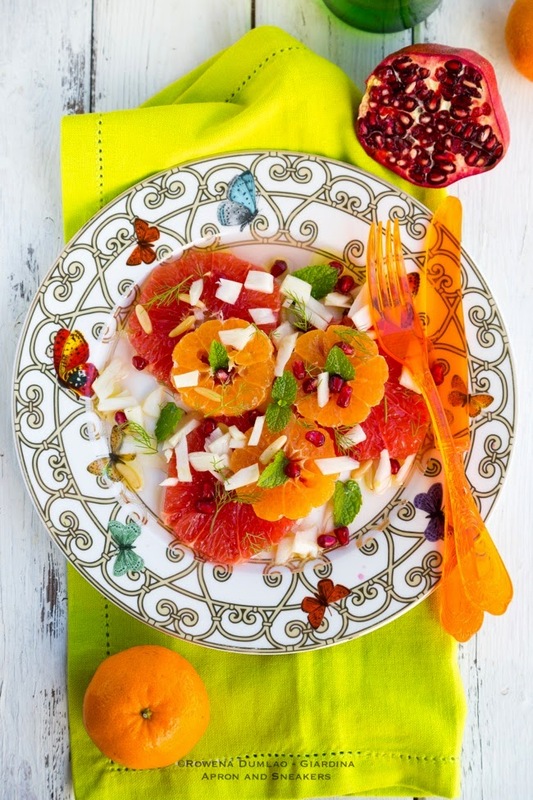 A combination of grapefruits, oranges, clementines, pomegranate, pine nuts, fennel & mint dressed with the simplest and one of the healthiest dressing there is - extra virgin olive oil and salt. 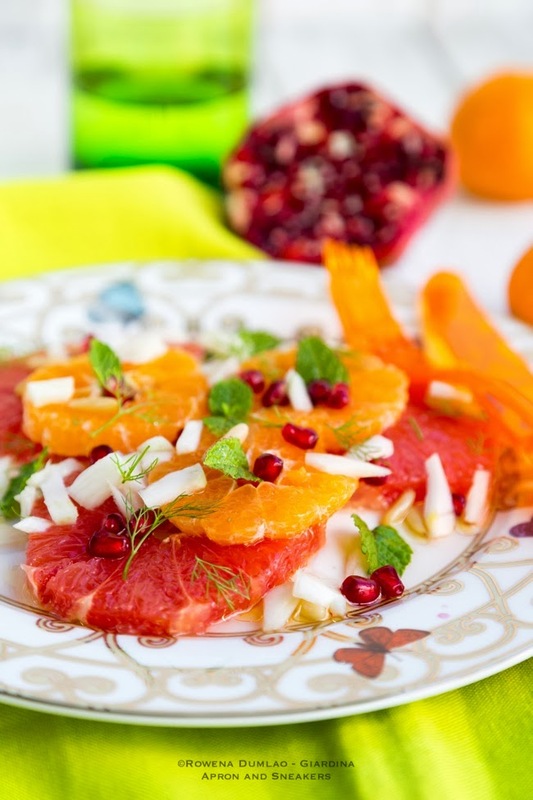 On the serving plate, arrange the slices of grapefruit, oranges & clementines. Garnish with the fennel, pine nuts, pomegranate and mint leaves. Drizzle with a good amount of extra virgin olive oil then season with salt.